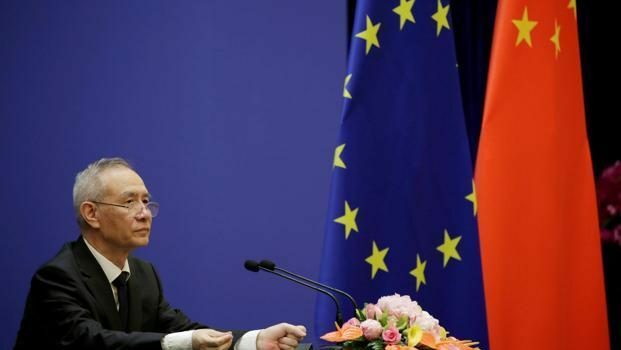 China and the European Union vowed to oppose trade protectionism and unilateralism, saying those actions could push the world into recession in an apparent rebuke to the US. Vice Premier Liu He—President Xi Jinping’s top economic adviser—said China and the EU had agreed to defend the multilateral trading system, following economic talks Monday in Beijing. The comments, made at a press briefing with European Commission Vice President Jyrki Katainen, come as both sides prepared to face off against US President Donald Trump’s tariff threats. Both China and the EU have recently come under pressure from Trump on trade. The bloc imposed tariffs on $3.3 billion of American products Friday in response to US barriers on imports of aluminium and steel, triggering threats of further tariffs on European cars from Trump. Later this week, the US Treasury Department is expected to release fresh rules on Chinese investment in technology companies, Bloomberg reported on Monday, putting additional pressure on China. The US is due to impose tariffs on $34 billion of Chinese imports from 6 July, and Trump has threatened to impose levies on another $200 billion of Chinese goods. If that threat is realized, it could cut as much as half a percentage point off China’s economic growth, and also hit the American economy, economists have said. Trump argues the global trading system is rigged against the world’s largest economy and has pushed heavily against what he sees as the unfair trade imbalance with China, the biggest exporting nation.